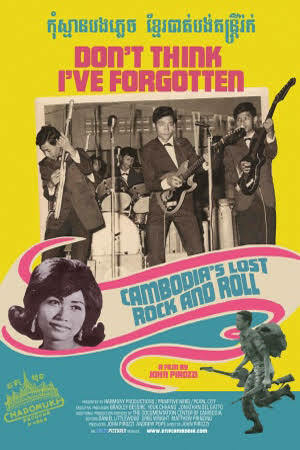 On Saturday night I watched the documentary Don’t Think I’ve Forgotten: Cambodia’s Lost Rock & Roll. It takes a look at a specific loss felt by the country of Cambodia during the genocide of some 2,000,000 citizens under the control of the Khmer Rouge from 1975-1979: that of Cambodia’s once flourishing music scene. Dr. LinDa Saphan, a Cambodian artist and Associate Producer and researcher of the film, introduced the screening. She closed her introduction by saying that this film, which aims to recognize what Cambodia lost and introduce this important aspect of Cambodia’s cultural history to others, is a “big middle finger to the Khmer Rouge,” the murderous regime that aimed to systematically wipe out Cambodia’s artists and their contributions. The documentary opened with a history and celebration of Cambodia’s Western-influenced rock and roll and its famous musicians from the 1950s-1970s, including the industrious Sin Sisamuth (Cambodia’s Frank Sinatra) and Ros Sereysothea. Both artists disappeared during the genocide with much of their music destroyed. You can read more about how the Khmer Rouge’s genocide nearly wiped out the rock music scene in this VICE article, complete with some of the great tracks embedded in the article. Go see the movie as well for interviews with some of the surviving musicians and to listen and appreciate the soundtrack from Cambodia’s golden age of music.